Property Ownership in Lebanon for Palestinian Refugees? I received the following note from Nadim Shehadi on the subject of property ownership by Palestinian refugees. Reports suggest that we seem to be nearing a deal on a limited overhaul of the legislation related to civil rights for refugees in Lebanon. There is consensus among the March 14th Christian parties and the Free Patriotic Movement that social and labor rights should be improved but property ownership should remain off-limits. This is to illustrate that the question of foreign ownership of land in Lebanon is a long standing one, and partly to answer your question about the property ownership issue for the Palestinians. There is no doubt that foreign property ownership is a controversial matter and one that will always remain an issue that raises anxieties and has to be borne in mind when discussing Palestinian rights to property ownership. It is not a trivial matter and I do not take it lightly. But the question is certainly not all about Palestinians – it is mainly about Gulf money buying up all the land, which was facilitated by the amendment to the property law of 2001 (the same amendment that excludes Palestinians from buying property.) This again is a highly emotional issue and it is difficult to address it with rational arguments: they will simply not be listened to. When a subject is that sensitive the best course is not to raise it or approach it at all. But in the case of Palestinians it is different because Palestinians used to be able to purchase property legally before 2001 like any other foreign national. Also, like any other foreign property purchase, it was subject to registration taxes of about 16 to 17 percent. Palestinians used to buy land in the name of Lebanese and then obtain a power of attorney giving them sole control over the property. This was common practice at the time not only with Palestinians but with many foreign buyers in general. It made sense because they could later sell it without having to pay the tax. The problem we have now is that the amendment to the law in 2001 excluded Palestinians from the ability to purchase land and it also prevented them from inheriting land or passing it on to their children. This is land that was bought legally before 2001. What is required is to reverse that and allow Palestinians to own property like any other Arab and like they did for 53 out of the 62 years since they came to Lebanon. The larger issue of foreign property ownership is a separate and different problem and if there is an amendment to that law it should also apply to everybody. Once matters are under the law then the law will deal with any infringements or illegal occupation of land. I will not insult readers of Qifa Nabki by pretending to explain to them the benefits of the rule of law and the sanctitiy of private property. What is certain is that the Lebanese state cannot expropriate private property; if it does, then it would be setting a precedent that would threaten more than just the Palestinians. There is a lot of scare-mongering about this and misrepresentation of figures. It’s as though 550,000 Palestinians will suddenly flood the property market and buy up the country and the Lebanese will not be able to buy even an apartment then. This is linked to the anxiety about foreign ownership which is deep rooted, as the pamphlet shows and is being awakened using the Palestinians. This is the overall problem with this whole debate about Palestinian rights: it awakens all the ghosts and it is based on wrong and exaggerated facts. Maybe this is a necessary process and rationality will prevail in the end. If it does then we must hit the nail on the head and deal with all the rights issues once and for all to allow us to concentrate on much more important matters related to the Palestinian file. “A few facts/details that might be helpful to the readers that are not familiar with the specifics of this issue. “Lebanon had restricted the rights of foreigners in owning land by the law passed in 1969. The restrictions used to be 500 square meters per foreign person (spouse and children do not represent separate persons for the purposes of this law) The 2001 amendment increased the restriction to only 300 square meters per person and it added that the foreign person must hold the citizenship of an internationally recognized country. That is how the Palestinian refugees came to be disallowed from land ownership. “Nadim Shehadi is right when he says that foreign land ownership in Lebanon is an emotional issue and as such reason does not count for much. Yet it is instructive to look at what the official figures say. The 2001 law limits the aggregate foreign land ownership in Lebanon to 3% of the total area. That amounts to just over 312 million square meters. The records indicate that outside of Beirut foreign land ownership in Lebanon is way within the 3%. Actually besides Beirut , Baabda, Metn and Aley it is under 1%. If the figures are accurate then foreign land ownership under the current restrictions could probably triple before it is to bump against the current ceiling. “But these figures are not very reliable since over 1/3 of Lebanon has not been surveyed yet and so sales activities of unsurveyed land is not reported. But a quick back of the envelope calculation regarding the potential land ownership by the Palestinian refugees would be revealing. “Since there are 400,000 registered refugees both in the camps and outside the camps and since the demographic structure is young with above average size of houshold then it would be fair to assume that there are about 80,000 households. The financial resources available to these households are meager but even if 1-in-4 decides to purchase land then the potential number of such transactions would be 20,000. Land in Beirut is one of the most expensive in the world and in Baabda, Aley, Broumana, Baabdat goes for over $1200 per square meter and therefore is out of reach for these potential new buyers. But even if we are to assume that each of the 20,000 manage to find and purchase a parcel of land od 800 square meters then the total 16 million square meters would represent only 5 % of the aloted aggregate of 312 million square meters for foreign ownership. I haven’t been following the discussion as much as I should, especially since it concerns me and my family, but I was reading l’Orient le Jour today (give me a break: it was in the waiting room), and the latest consensus from the M14 Christians seemed to be (correct me if I’m wrong) allowing the full right to work but requiring a work permit like other foreign nationals. This might sound fair enough, but it would likely end up being a net loss for most Palestinians, since it’s not likely there’d be a rush to hire Palestinians and those who had already managed to find work would suddenly find themselves in a position to have to pay around $1,000 a year to stay legal. I think that Nadim discussed this point in his interview on the blog a couple weeks ago. You’re right: it has the potential to disrupt the mechanisms that people have used thus far to get by. A few facts/details that might be helpful to the readers that are no familiar with the specifics of this issue. 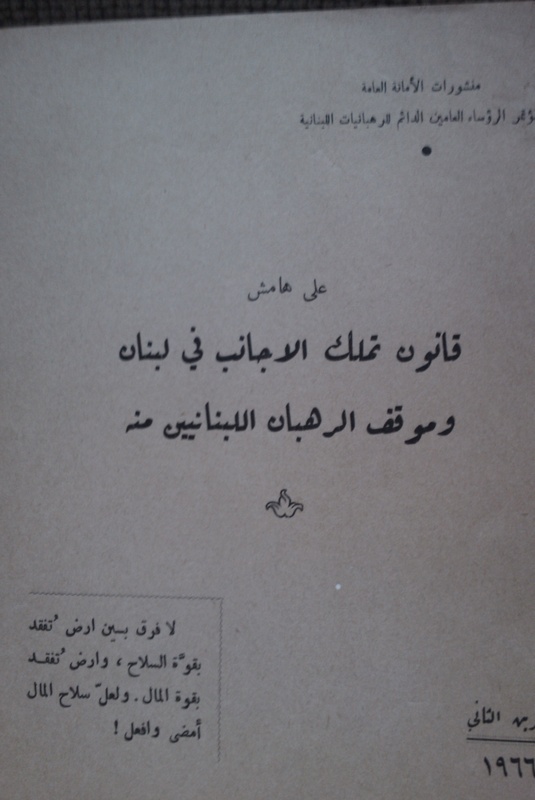 Lebanon had restricted the rights of foreigners in owning land by the law passed in 1969. The restrictions used to be 500 square meters per foreign person (spouse and children do not represent separate persons for the purposes of this law) The 2001 amandment increased the restriction to only 300 square meters per person and it added that the foreign person must hold the citizenship of an internationally recognized country. That is how the Palestinian refugees came to be disallowed from land ownership. Nadim Shehadi is right when he says that foreign land ownership in Lebanon is an emotional issue and as such reason does not count for much. Yet it is instructive to look at what the official figures say. The 2001 law limitis the aggregate foreign land ownership in Lebanon to 3% of the total area. That amounts to just over 312 million square meters. The records indicate that outside of Beirut foreign land ownership in Lebanon is way within the 3%. Actually besides Beirut , Baabda, Metn and Aley it is under 1%. If the figures are accurate then foreign land ownership under the current restrictions could probably triple before it is to bump against the current ceiling. Bur these figures are not very reliable since over 1/3 of Lebanon has not been surveyed yet and so sales activities of unsurveyed land is not reported. But a quick back of the envelope calculation regarding the potential land ownership by the Palestinian refugees would be revealing. Since there are 400,000 registered refugees both in the camps and outside the camps and since the demographic structure is young with above average size of houshol then it would be fair to assume that there are about 80,000 households. The financial resources available to these households are meager but even if 1-in-4 decides to purchase landthen the potential number of such transactions would be 20,000. Land in Beirut is one of the most expensive in the world and that in Baabda, Aley, Broumana, Baabdat goes for over $1200 per square meter and therefore is out of reach for these potential new buyers. But even if we are to assume that each of the 20,000 manage to find and purchase a parcel of land od 800 square meters then the total 16 million square meters would represent only 5 % of the aloted aggregate of 312 million square meters for foreign ownership. This whole issue is an emotional one and is fueled by unsubstantiated fears. Common sense , decency, international law combine to say that the Palestinian refugees are to be treated just like any other potential group of investors in the country. Correction: please read 500 square meters and 300 square meters , in the second paragraph above, instead of 500 … and 300. Sorry about the error. It seems to indicate that Syria-Hamas-Iran would do anything possible to thwart the Arab peace initiative. Arman points out that he wrote his book after a thorough study, based on a lengthy series of interviews with his fellow prisoners. Most of them were not acquainted before that with one another and did not even know of the existence of the other squads. But it transpired that at the beginning of 2002, all the groups were given instructions from above to thwart the Arab Peace Initiative (which was first confirmed that year ). The instructions were carried out in full: the attack on the Park Hotel in Netanya on the first night of Passover, which took the lives of 30 victims attending a seder, led to Israel’s invasion of the West Bank. Operation Defensive Shield, as it was known, did not permit the peace initiative that had been accepted on March 28 in Beirut to gain the attention of the Israeli public. I would say just like everything else in Lebanon and the Arab world this issue is fueled by racism, bigotry and lack of laws and human rights. not just simple emotions of nationalism. As opposed to the ethnic cleansing of Palestinians by Jewish Zionists and the continued dispossession, occupation, and oppression of Palestinians by “Israel” which is fueled by equality, justice, love and respect for human rights. And thank you all for your comments about the current debate in Lebanon. I am sure many of you may have ideas and thoughts about what is going on here in Lebanon. Please post comments on our blog, or on our Facebook (Right To Work). Like many of you have said, the issue is a very emotional issue; however, underlying these emotions are people’s fears that their needs will not be met if the Palestinians gain access to the labor market and property ownership. Do you think it is possible that each side’s needs and interests can truly be met?? My injustice toward them? My dear ally the thug Nabih Berri? I like how you labeled me long before you knew anything about me. Enjoyed the post, although I have trouble believing that those who oppose returning to Palestinians the right to own land are really that concerned about whether 1 or 3 or 5% of the land in Lebanon is actually owned by foreigners. This is not issue of economic nationalism or xenophobia, but rather Palestinianophobia. Like economic and social rights, the issue of Palestinian land ownership in Lebanon is primarily tied to the question of the future of the Palestinians. Will they stay or will they go? This might seen an abstract question at a time when the peace process seems (more) frozen (than usual). But, so goes the often unspoken sentiment, if they own land (or have work permits or move out the camps) they will be more likely to stay. Fill the fridge with beer, and the houseguests will stay. This fear is in turn directly linked to longstanding sectarian fears of the type that led the Rahbaniya to publish that propaganda. It seems to me that the calculation made by Ghassan Karam is not accurate when he assumes that the 20.000 Palestinian households would each buy 800 sq m. Rather, they would buy appartment of 100 sq m, which makes only a fraction of what he calculated. If we assume the typical family buys 100 sq in a plot of 800 sq m on which we have a 8 storeys building, it counts only for 100 sq m. Which means that we can divide the figure of Ghassan by 8. It’s even much lesser than what he said. I want to thank you all first for taking the time to comment on the post listed above. I just would like to confirm several points. 1. Palestinians with U.S. passport, for example, can own a land in lebanon, but only 300 square meters. Right? 2. Palestinians with U.S. passport can’t register any type of property under their name. Is this right?